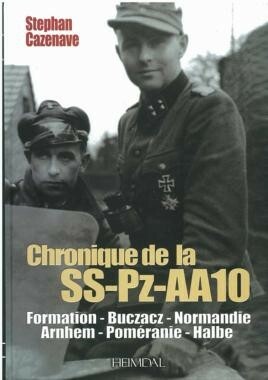 This exceptional volume is a comprehensive account of one small unit in the 10th SS Panzerdivision "Frundsberg". Comprising the contributions of some twenty veterans, the book contains many previously unpublished photographs of the SdKfz 250/251 and the Spahwagen (reconnaissance armored vehicles). Unfortunately, due to sales rights restrictions, we cannot offer Chronik Der SS-Pz-Aa10 for sale in your country. This exceptional volume is a comprehensive account of one small unit in the 10th SS Panzerdivision "Frundsberg". Comprising the contributions of some twenty veterans, the book contains many previously unpublished photographs of the SdKfz 250/251 and the Spahwagen (reconnaissance armored vehicles). It provides a detailed account of their training in France and of all the battles they fought from Tarnopol in the Ukraine to Normandy. The author has compiled detailed lists showing the members of each company and provides detailed biographies of each of the officers who served and fought, with particular attention being given to those who received top awards such as the RK and the DKiG. Two units in particular are singled out for special treatment: Erich Rech's Spahtrupp (uniquely Rech received the RK for the action of this unit in Normandy), his Panzerfahrer and the Panzerchef support armored vehicles. Lists of losses and honors support the study. Published in hardback in a bilingual French/German edition, the book comprises some 300 pages and 200 photographs, most of which have not been seen before.